Born in New York City, Larry Weinberg enlisted in the army in World War II at age 17. He was wounded in 1944, awarded the Purple Heart and discharged in 1945 with 100% disability pension. He attended Cornell University, the University of Arizona and the University of California at Los Angeles. 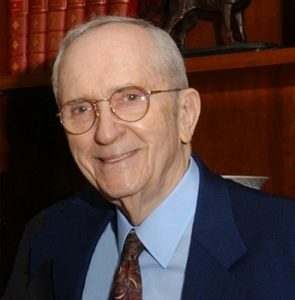 In 1948, Mr. Weinberg founded the Larwin Company and served as CEO until retirement. Starting with four homes, the Larwin Company grew into the largest privately-owned housing company in the U.S. by the late 1960’s. Larwin merged into CNA Financial Corporation and continued as one of the three largest housing producers nationally, developing over 8,000 residential units annually. In 1950, Weinberg founded Com-Air Products, Inc., which engaged in the design, manufacture and assembly of hydraulics, pneumatics and fuel assemblies for jet engines and airframes. Mr. Weinberg is a former member of the Board of Directors of the NAHB, and a co-founder of the Master Home Builders Council and the National Council of Housing Producers. He is the former Vice-Chairman of the California State Housing Commission and has served as the former President-elect of the Building Industry Association. Mr. Weinberg served as a Member of the Executive Committee and the Board of Directors of CNA Financial Corporation from 1969-1980. Mr. Weinberg was a major owner of the Portland Trail Blazers from 1970 to 1975 and the principal owner and CEO from 1975 to July 1988. The Trail Blazers won the NBA Championship in June 1977. He served as the Chairman of the Board of Governors of the NBA from 1980-83. ​Mr. Weinberg is the President Emeritus of the American Israel Public Affairs Committee (AIPAC) and served as its’ President/CEO and Chairman. Through his leadership, AIPAC grew into a national bi-partisan organization of Americans dedicated to strengthening US/Israel relations. He is the recipient of the Brotherhood Award of the National Conference of Christians and Jews.